Sweet, a little bitter, and a whole lotta delicious. That's this dish. 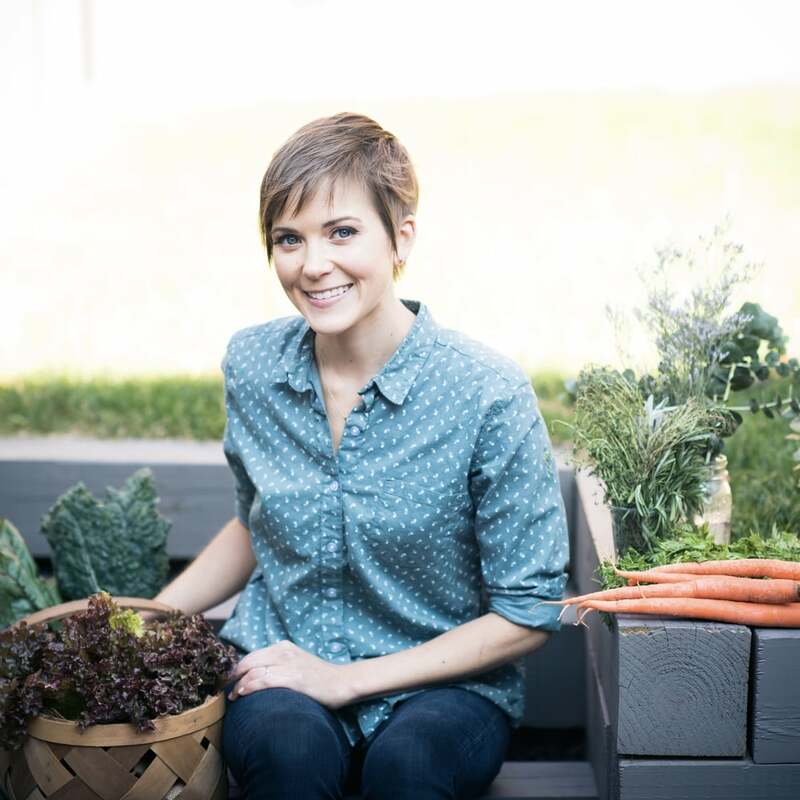 It's stunning as a holiday side dish but easy enough and healthy for that what-do-I eat-between-all-of-the-holiday-parties conundrum. Just add a grain, and you're in business. I have a thing for delicate squash. 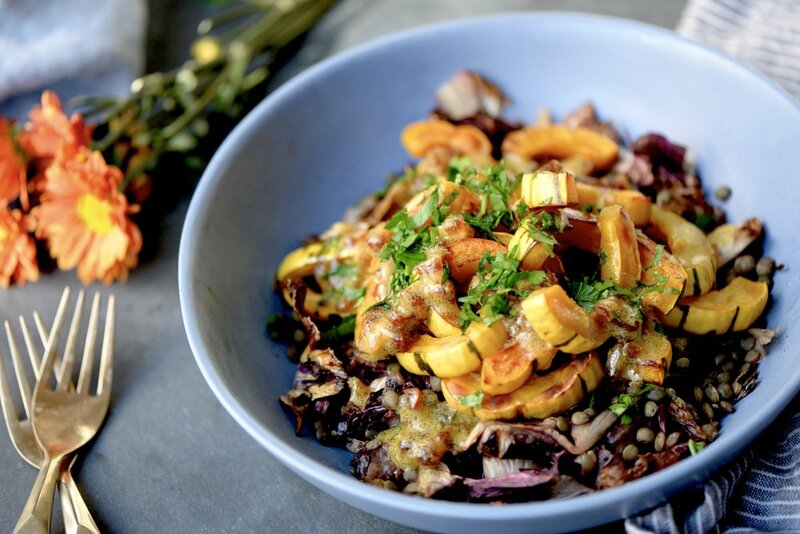 After all, it's one of the easiest winter squashes to cook given that you don't have to peel it and the skin and flesh are tender enough to cut through with a knife without mustering up much might (I'm looking at you butternut and kabocha!). If my dull knives can cut through them with ease, it's a winner in my book. So radicchio. Let's talk about it. It's the beautiful cabbage looking thing in the produce section that adds a delicious bitter bite and purple hue to salads when thinly sliced but that transforms into something almost sweet when roasted. It's flavor mellows and it just wilts in the best way. Lentils add a little protein and a welcome texture to the vegetables. The star of the show just may be the date vinaigrette. I originally was going to chop dates and add them like you would dried cranberries in order to enhance the natural sweetness of the squash and roasted radicchio, but I threw them in the dressing at the last minute, and I'm glad I did. They soaked up just a little vinaigrette to soften but still retain their shape and in turn gave the vinaigrette a deeper caramel flavor that was able to permeate the whole dish. We ate this alongside our mains the first go-around, but I served it atop brown rice with some chopped toasted walnuts as a more substantial lunch itself. If you're not vegan, a salty feta or tangy goat cheese (I used a local feta), is yum-o. Preheat oven to 400 degrees Fahrenheit. Toss delicata with 2 teaspoons olive oil and spread in single layer on pan. Place radicchio on same baking sheet and drizzle with 2 teaspoons olive oil and 2 teaspoons balsamic vinegar. Sprinkle everything with salt. 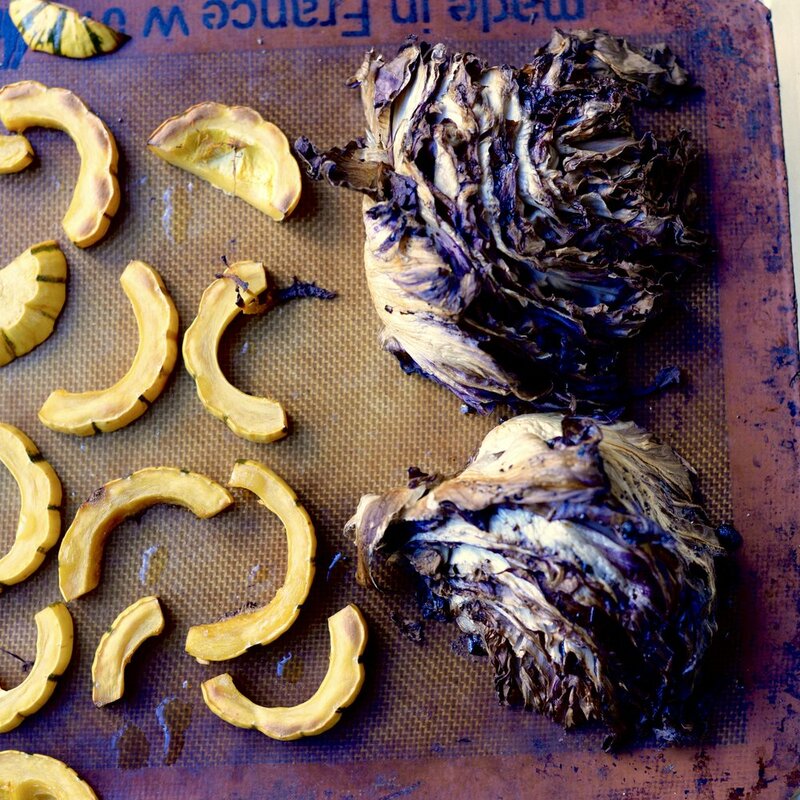 Roast vegetables in oven for 25-30 minutes or until squash and radicchio are golden brown. Remove from oven and chop radicchio in large pieces. Meanwhile, cook lentils. Place the lentils in a small pot and cover with water by 1-2 inches. Bring the water to a boil and then reduce to a simmer, cooking for 15-18 minutes uncovered or until lentils are tender but not mushy. Drain and set aside. Make vinaigrette. Whisk olive oil, vinegar, and garlic clove in small bowl. Add dates and salt and pepper to taste. 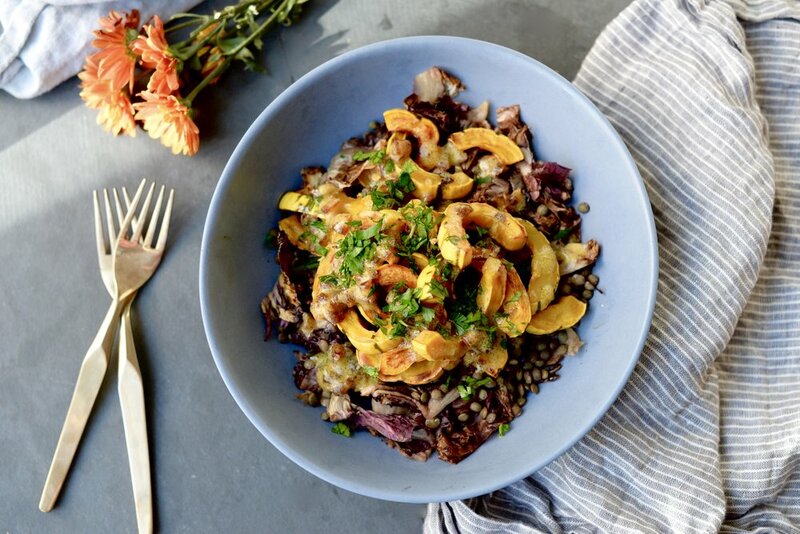 Combine radicchio, lentils, and delicata in bowl. Drizzle with vinaigrette and sprinkle with parsley. Serves 4. Have you ever heard of sorghum? If not, not to worry. You are probably not alone. I made a big pot of it a few days ago, and my fiance asked me if I was serving little eyeballs for dinner. Probably not the best image to leave you with if I want you to give it a go, but it is a pretty unique little thing. I had read about sorghum in some magazine several months ago and waited to get my hands on a bag when it went on sale. Well I finally snagged a bag, and I feel like this recipe really accentuates all of its wonderfully delicious qualities. So what is it? It is a round grass reminiscent in shape of Israeli couscous, the fat couscous you may have come across (Moroccan couscous is itty bitty), but it has a little black dot on each kernel, hence the eyeball comparison. It is native to Africa and has the most delightful chewy texture and subtle sweetness. Maybe you have heard of sorghum molasses? It is also high in fiber and iron, making it even more worth incorporating into your diet. Sorghum does take a little while to cook- about 50 minutes in fact- so if you are short on time, you can substitute another grain of your choice as the base or even use Israeli couscous. The slight sweetness of the sorghum pairs beautifully with the earthy chard and delicata squash and the slightly sweet but nutty tahini tofu. This bowl provides a rainbow of colors and textures, so it is super satisfying. The ingredients can be doubled or even tripled because it makes delicious leftovers. Have you ever tried sorghum? If so, what is your favorite way to cook with it? Cook sorghum. Combine sorghum and water in a pot. Bring to a boil over high-heat. Reduce heat to low and cover, and allow sorghum to cook for 50 minutes. After 50 minutes, keep covered and remove from heat and allow to rest for about 10 minutes. Remove lid, stir, drain any excess water, and then sprinkle with a pinch or two of salt, and set aside. Prepare Swiss chard. Wash and loosely dry chard. It is okay if some water lingers on the leaves. Remove the stems from the chard leaves, and finely chop. Roll the leaves into a cylinder and cut into 1/2-inch ribbons like you were going to chiffonade basil. Heat 1 tablespoon olive oil over medium-high heat. Add chopped chard stems and cook until softened, about 5 minutes. Add garlic and cook for 30 seconds or until fragrant. Add sliced chard leaves, a generous pinch of salt, and stir. Cook until chard wilts and is tender, about 6-8 minutes, tossing occasionally. Add red wine vinegar, stir, and then remove pan from heat. Season to taste with salt and pepper. Set aside when done. Assemble the bowls. Use a few scoops of sorghum as the base and top with roasted squash, sauteed chard, tahini tofu, and a drizzle of tahini. Enjoy! Serves 3-4. Preheat oven to 400 degrees Fahrenheit. Line a baking sheet with parchment or a Silpat. Remove the tofu from the package, drain, and set on a plate. Take a cutting board or plate and press gently and evenly on the tofu to expel a little of the soaking water. Set the tofu on a cutting board and cut into 16 cubes. In a small bowl, whisk the remaining ingredients together. Add the tofu to the bowl, mix gently to coat, and spread in an even layer on the parchment. Bake for 30 minutes or until golden on the edges and firm. Remove from oven, and allow to cool for about 5 minutes (this will also help them hold their shape), before scooping from the tray.